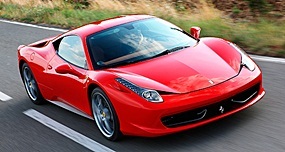 The latest Ferrari, the 458 Italia coupe, is doing the rounds of the Ferrari dealerships before its general release around June of this year. With Tesla in the US releasing its all-electric supercar, there was talk that Ferrari would do the same, but not to be says Ferrari CEO Amedeo Felisa. According to him, Ferrari will not produce an all-electric supercar, but it will reveal the first hybrid development program cars in the shape of a petrol-electric 599 at the Geneva motor show next month. The 599 hybrid’s debut at Geneva on March 2 was also confirmed by Ferrari chairman Luca di Montezemolo at the recent launch of the Ferrari 2010 Formula 1 car. CEO Felisa said the full parallel hybrid drive system, which has been fitted to a Ferrari test mule for 12 months, would reduce fuel consumption and emissions in the 599 by up to 25 percent. Somehow, I cannot see a hybrid petrol/electric having the wonderful exhaust note that Ferrari has had for years, but we shall see. He did say, “If you look at global warming, the right solution is not full electric. It’s more a marketing solution than a real one. Sound is just as important as design and performance for Ferrari. We will not make engine sounds with speakers.” The Ferrari chief, however, cautioned that Ferrari’s first hybrid model, which would carry a weight penalty of 80 kg, was at least five years away from production. Last week I mentioned that Wayne Eckersley was a famous F1 engineer and one of the drivers he fettled won the world championship. Eckersley also made a six wheel F1 car. I asked what manufacturer did he make it for? A bit of a trick question, as Wayne Eckersley was the chief engineer at Williams when Australian Alan Jones won the world championship in 1980, but he built the six-wheeler for March Engineering. Unlike the six wheel Tyrrell which had two extra front wheels, the Eckersley concept was two extra rear wheels. So to this week. In one family there was a very successful racing driver and his sister was a very successful rally driver. Who were they? How did Toyota get in such a mess? Toyota Motor has just gone through the worst year in the 70 year history of the brand, losing billions of dollars (not yen). However, 2010 has started to look just as bad, if not worse, with the recall of millions of their vehicles world-wide with an accelerator problem. What’s more, the part was not even made by Toyota, but by one of their suppliers, though I would imagine to the Toyota design. What must be taken into account is the fact that recalls and corrections cost big money for major manufacturers like Toyota. Let’s, for the sake of the exercise, imagine that it only costs $10 to fix the problem. That’s not much, but now multiply that by one million vehicles. That $10 fix just cost the company 10 million dollars! And since the estimated number of vehicles Toyota has to fix is somewhere around eight million, that’s not small change. What’s worse, that does not take into account the loss of the good name of the company, especially Toyota who has worked hard for many years to give the impression of being bullet-proof in the minds of the motoring public. The chairman of Toyota, Mr Toyoda, has been criticized in some sections of the media for not apologizing sooner. Poor bugger is in the situation of damned if he does and damned if he doesn’t. And even if he committed hara-kiri kneeling on the sacrificial mat on prime time television it doesn’t alter the fact that there was a screw up affecting millions of their cars across several of their models. What is also being conveniently forgotten is that the sticking throttle pedal does not affect every Toyota. It is only a very, very few drivers in amongst the millions of owners who have had this problem, but now every Toyota is looked upon as if it is a mobile hand grenade, just waiting to go off - which is not the real scenario. No, I feel sorry for Mr. Toyoda, who has found himself in a lose-lose situation, but he should take heart in the fact that within two model years the press and the public will have forgotten about it all. 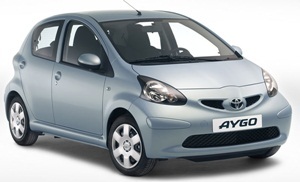 In the meantime I am quite happy to see my wife drive the children to school in our family Toyota. They have more chance of being hit by a bus than they have of the accelerator sticking, and even if it did, I am confident that my wife would apply the brakes and then turn off the ignition. 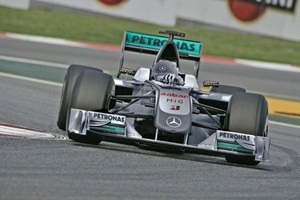 The F1 teams have shown their 2010 contenders to the press, and are now involved in testing the new designs before the first Grand Prix (Bahrain March 14). The major difference for this year is that refuelling is no longer allowed during the race, so the fuel tanks have to be roughly twice the size. This has meant that the cars are longer in the wheelbase to accommodate the larger tanks. This is where the bluffing begins. There will be probably a one second difference in lap times between full tanks and empty tanks, so when a team’s driver sets a lap time, was the fuel tank full or was he running on a sniff? If they want to impress a would-be sponsor, lap times at the top of the list will look good, so low fuel is the answer. If the team is trying to sandbag, and not show their real potential, then the driver will always be going out on full tanks. So the new fuel tank size is even more important than ever. Whilst we will all look at the Formula 1 websites to see if Button is quicker than Hamilton or quicker than Schumacher or Rosberg, it really does not mean much at this stage. The final qualifying session in Bahrain is when we will really see just which team has the upper hand, and which driver in that team. Asian Motor Sport becoming stronger? Over the years, I have tended to watch ‘professional’ meetings, but the professional meetings do not really show true, grass roots, motor sport. This was really hammered home the other day when I clicked on the website for the Super Club race promoters and looked through the events which were coming up for the meeting. On the Sunday there were a number of practice sessions up till 10.30 and then the racing started with 16 races up till around 5.30 p.m. The races were generally around six laps and there were 10 minutes between races. What a race feast! Now there are those who say that we should be concentrating on Formula 1, and if we don’t have a Formula 1 track then we aren’t a motor racing nation. I’m afraid I don’t agree. Formula 1 is the tip of the pyramid, but if there isn’t a wide base to support it, then it will all fall in a heap. Guaranteed! Take China, for example. They have an F1 track, but no real grass roots base. Motor sport is then not in the DNA of the community. The end result could be seen in Shanghai, where the promoters were giving away tickets to try and make the stands look less empty. This was also the case in Malaysia. Some sections might try and deny it, but the TV camera doesn’t lie. We are still suffering from what has been described as the Global Economic Downturn, and high level motor sports require high level funding. In fact, the funding levels in F1 have become so high that even manufacturers such as Honda, BMW and now Toyota, have withdrawn from the top echelon. Having said that, what corporations in Asia are prepared to put millions of dollars into a sport, where there is no guarantee of a return? In fact, it is generally the opposite. It should not be forgotten that there is only one race team still in F1, which has been there since the 1950 Silverstone Grand Prix, without a break. Yes, that is Ferrari. So back to the real base for motor sport in any country, not just Asia or ASEAN. There needs to be affordable classes in which drivers can compete without it costing an arm and a leg. Literally ‘Run what you brung’ categories. Those initial and very inexpensive race categories will bring on another class of racing, as those who get ‘hooked’ will want to move up. Not to a fully sponsored top class drive, though it may be an ambition, but to one where the cars are a little more modified, a little faster, and only (hopefully) a little more expensive to run. These will still be essentially road cars. Race on Sunday and drive to work Monday. Did you know that Pattaya even had a two cars at a time ‘hill climb’ using the public road at Pratamnak Hill? About 12 years ago, it was a great event - an uphill drag race with one right and one left hand corner, with the cars staying on either side of the white line. Sa Keow also has a temporary track and Chiang Mai has a public road section it uses for the Honda and Toyota one make races. This is good in many ways. 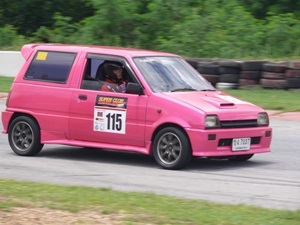 It brings motor sport to the notice of the people in the provinces, and allows local drivers to “have a go”. If there is no opportunity to try motor sport, then once again, with no grass roots, there is no base for faster (and more expensive) categories. I cannot emphasize enough the importance of the ‘novice’ classes to the health of motor racing in all countries as a whole.